Radha Daga, who went from a textile exporter to food entrepreneur at 60 years of age, shares her incredible journey with Shobha Warrier. At 60, when people retire from work, she decided to be an entrepreneur. At 75, when people prefer to sit at home and relax, she commutes for an hour and a half to her factory. When people of her age complain about aches and pains, she walks around the factory all the time. She even refuses to use the elevator, and takes the staircase. 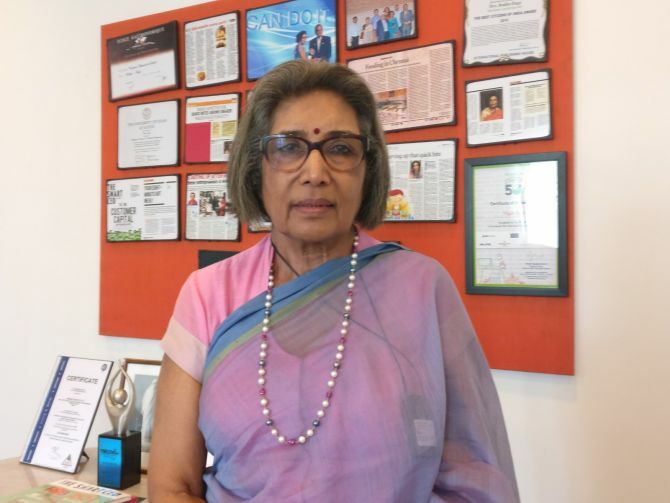 That is 75-year-old Radha Daga for you, the founder-managing director of Triguni Foods, and the woman behind the Magic Upma and Magic Biriyani, which the air travellers on Indigo are familiar with. Sitting in the simple office room of her factory adorned with pictures of The Mother (of Aurobindo Ashram) whom she considers her guru, Daga told Shobha Warrier/Rediff.com that her entrepreneurial venture started in 1987 when she launched Chimise Exports -- a garment unit with an investment of around Rs 90,000. I do not know when I started dreaming about becoming an entrepreneur, or doing something independently. I know now that it takes time to realise one’s dreams. Only when the right time comes, you will get to do what you want and realise your dreams. At least that’s the case in my life. As a child, I wanted self-expression and listened only to what my mind or soul yearned for. I never blindly followed what the elders or my gurus said. Maybe it had to do with the kind of upbringing I had. I grew up and studied at the Aurobindo Ashram under the Mother, and one thing Mother taught us was to listen to our hearts, always. We are actually Marwaris settled in Uttar Pradesh as my father, B N Maheswari, was an IAS (Indian Administrative Service) officer from the UP cadre. As he got transferred frequently, I grew up in my maternal grandparent’s house near Meerut. The turning point in my life was when I happened to go to the Mother’s ashram in Pondicherry on August 15, 1947, the day India got Independence. I went with my grandfather who was with the Congress party and fought for the country’s Independence. The images of Partition rattled him so much that he wanted to be away and be with the Mother on the day India won Independence. I still remember the journey we undertook to Pondicherry. He had taken with him 30-40 people from Meerut, and all of us boarded a train from UP so that we could be there on the 15th at Pondicherry with the Mother. Although I was a small child, the image of Mother, the serenity on her face and what she spoke, had a strong impact on me. But my father could pay a visit to Mother only in 1953 and I, too, tagged along with him as I somehow liked the atmosphere at Mother’s ashram. I think it was on the third day that Mother met us children while we were playing. I told her in Hindi that I wanted to stay with her at the ashram. Mother didn’t know Hindi, so she asked somebody what I was saying. She smiled when she heard my request. That was the first time I had expressed such a wish and I hadn’t told this to anybody at home till then. I insisted on staying back at the ashram and my father had to go back without me. Thus, my education started there at the Ashram School, and I learnt French, English and so many other interesting things there. Whatever I am today and whatever I have achieved later on in life, was all because of the foundation I received at the ashram. That was one place where a child was given total freedom to do what she wants and dream without boundaries. Though nobody put any restrictions on us, we behaved in such a disciplined manner that it makes one wonder now why all of us children behaved that way. The unfettered, free atmosphere let the mind think free and dream. That was what Mother wanted each child to do; have a mind that flew without any boundaries. Ashram made me an individual who was capable of thinking without fear but in a disciplined and structured manner. I was so attached to the ashram life that even when I was a college student in Himachal Pradesh, I used to go there during my vacation, as if it was my real home. Till I got married at 20, I went there to recharge my batteries. My only condition to agree to the marriage was that Mother should approve of it as I considered her my Divine Mother. Life changed dramatically after marriage like it happens with all women in India. As my husband, Ramesh Daga, worked with Hindustan Motors, I moved with him first to Kolkata and then to Madras which is Chennai today. I could not bring myself to sit at home idle as I always had this desire to do something substantial. Though all the banks talk a lot about helping women entrepreneurs, my experience has not been good. My life as a working woman started with a travel agency, for half a day first and then I became a full-time employee. I started to work mainly to prove to myself that I was capable. Then, of course, there was this desire to be independent financially and spiritually. I always wanted to do something on my own, give people jobs and make a difference in their lives. It was to make people realise the dignity of labour that I wanted to start something on my own. I had felt in those days that most people didn’t want to work hard and they preferred to get everything easy in life. It all started when a friend of mine living in the US requested me to help her ship silk shirts from here. So, I sourced shirts from various places and shipped to her. That was the beginning. Then I thought, why not start a unit of my own instead of sourcing from others? In 1987, when I was in my mid-forties, I started Chimise Exports, my first entrepreneurial venture -- a garment unit with an investment of around Rs 90,000. In those days, export of garments from Chennai was a lucrative business. My friends who were in the garment business gave me work and that was how my journey as an entrepreneur started. I also thought I could give jobs to a lot of women through the garment unit. Funnily, I did not look at what I was doing as a business; it was just social work -- giving employment to underprivileged women. I knew what I was doing was an entrepreneur’s job yet I called myself a social worker. But one thing I was very particular about was, we should work like true professionals and the shirts that we made should be of good quality. I was happy I could make a difference in the lives of many women and also make customers happy with our high quality products. Soon, I realised that I would not be able to give my workers a good salary unless I worked to get a good profit. That was when some of my friends introduced me to a few buyers abroad and I started directly exporting from my unit. I also renamed my venture as Chimise Indus Pvt Ltd. The unit grew beyond my expectations and in no time, we were making 2,000 shirts a day and exporting all over the world. As the exports grew, I wanted to move from the rented factory to my own. But it was an ordeal constructing my own factory as no bank was willing to give me a loan even though I was a successful exporter. If an entrepreneur can make the people who work for her as passionate as she is, half her work is over. They felt giving me a loan was a risky proposition. Though all the banks talk a lot about helping women entrepreneurs, my experience has not been good. I am proud to say that I built my own factory with the profits I made, with my own money. That’s why I say, if you do your work sincerely and passionately, your dream will definitely be fulfilled. That’s what my life has taught me. My exports were successful and money flowed in and with that, my factory also got ready, brick by brick. I bought all the machinery myself and employed more women. By 2002, our factory was ready. Having one’s own factory is a dream come true for any entrepreneur and it was a happy day for me and my people when we moved from the rented premises to our own factory. It was very important for me that I take care of the people who worked for me. I wanted their lives to improve. That was more fulfilling for me than the profits I made. The most satisfying part of my journey is that those people who were with me when I started in 1987, are still with me. I look at them as my children and I consider it my duty to take care of them. That's why I decided to build apartments for many of my staff after I built my factory. I could make profits only because all of them worked tirelessly for me. Once the factory was ready, I decided to call myself a full-fledged entrepreneur; I was not a social worker anymore. Though I was hugely successful as an exporter of garments, my dream was not to be that. Even before I started as a social worker, even before I started exporting garments, I had this dream deep inside me to be a food entrepreneur. I see this technology as the future in the ready-to-eat market as more and more couples are working and they do not have the time to cook elaborate meals. Our products have no preservatives and 100 per cent natural -- closest to home-made food. If you ask me, what made me choose food, I don’t know. That was my dream -- to be an entrepreneur in the field of food though I didn’t know how to cook when I got married. Initially I didn’t know what I was going to do as a food entrepreneur. Every day I had a new idea, from making chips to jams and marmalades, the idea changed all the time. Then, I realised I had to do something very innovative to be able to compete with the established names in the food industry. Years ago when I expressed my desire to be a food entrepreneur, my husband asked, where is the money? I didn’t have the money to realise my dream then. So, when I saved enough money from the exports, I told myself, enough of garment exports; it was time to chase my dreams. I was 60 at that time. Yes, when people retire from jobs, I started my life as an entrepreneur. The beginning of my journey as a food entrepreneur was quite exciting and challenging. In 2010, I converted one small room in my garment factory for this purpose, and my chef and I started experimenting. We had a small machine that dehydrated food products. The idea was to create genuine food that had more shelf life. At that time, my idea was to create dehydrated home food for students and working professionals. As the product got ready, we did a study on our target groups and it was then I realised that what we were following was an expensive process. We went on experimenting, and the first successful product we readied was lemon rice and then biryani, tamarind rice followed. I named my venture Triguni Food Pvt Ltd and the products are Eze Eats. In 2012, by the grace of God, IndiGo Airlines came to know about our biryani and they contacted us. It is a product that gets ready in 8 minutes when you pour hot water into the cup. It was a perfect product for them. Thus we got one of the biggest names in India as our first customer. The initial order was very small -- just 2,500 cups of biryani and tamarind rice over a period of one month. The response from the customers was quite good and IndiGo, too, was quite satisfied with our product. We created upma in 2013 when Auroville asked for it but finally it was IndiGo who started ordering it. We had the brand name Eze but IndiGo loved Upma so much that they branded it as Magic Upma and it changed the fortune of our company too, magically. They buy 150,000 cups of upma and biriyani a month from us. As the order grew, I started investing more and more in the machinery, and slowed down on garment exports. By 2015 August, I closed down the garment unit completely and it became a 100 per cent food factory. Today, we have the capacity to produce 9,000 cups a day. Whatever I am today and whatever I have achieved later on in life, was all because of the foundation I received at the Mother's ashram. Eighty-five per cent of our turnover of Rs 11 crore came from IndiGo and the rest from retail stores. Our products (we have around 14-15 products) with a shelf life of 6 months are in the retail stores in Delhi, Mumbai, Kolkatta, Chennai and Bangalore. Our dal-chaval has gone to the Netherlands, Singapore, and the United Arab Emirates. As I am trying to export a brand which is relatively unknown to customers, it will take time for me to conquer new markets. However, all those who have tasted our food, have liked it. So, there is acceptance and when there is acceptance, there is hope. I see this technology as the future in the ready-to-eat market as more and more couples are working and they do not have the time to cook elaborate meals. More than anything, our products have no preservatives and are 100 per cent natural -- closest to home-made food. It is my passion to dream, I pass on my passion for quality to the people who work for me so that they also dream like me and be passionate about the venture. If an entrepreneur can make the people who work for her as passionate as she is, half her work is over. It is not one person but her team, the people who work who make a dream come true, and I have a team of 130 people dreaming along with me. It was my dream to be an entrepreneur in food. I chased my dream and realised it now. And I have no other dream to fulfil. I have no plan to have any other venture. On second thoughts, I feel one’s dreams never end. If you don’t dream, you don’t exist. You need to dream to look forward to in life. The dream that I have is to see that our food reaches its potential. This is my baby and it is able to stand on its legs now but I want to see it grow and walk and run and reach its true potential. Many people ask me why I decided to be a food entrepreneur at 60. That was because food was my passion and this was what I had been dreaming of doing all my life. The dream was somewhere inside me but I could not see my dream blossoming into reality till I turned 60. Now my husband has retired and enjoys his retired life while I work full time. At 75, I am as passionate and energetic about my work and that is because work is like multivitamins for me. Super-rich young Indians have a new success mantra!